You Are Still a Box and you will remain as one. Read more details for You Are Still a Box. 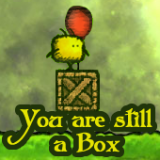 You are still a box and always be one! Take the advantage of being a heartless shape and use it to guide all the cute chicks in their daily puzzled adventures.